NOTE: LEGO® is a trademark of the LEGO Group of companies which does not sponsor, authorize or endorse this App. 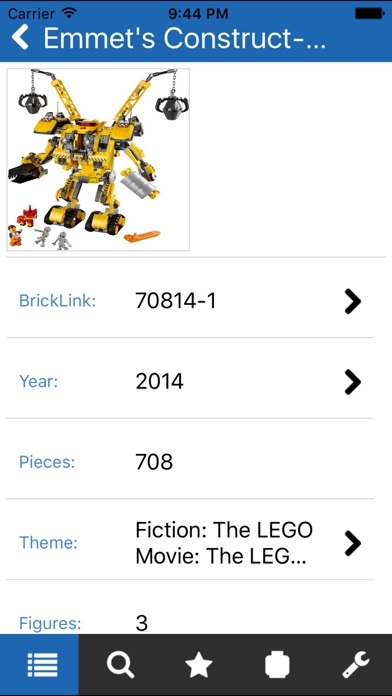 The Unofficial LEGO Minifigure Catalog App is a must for every LEGO enthusiast! 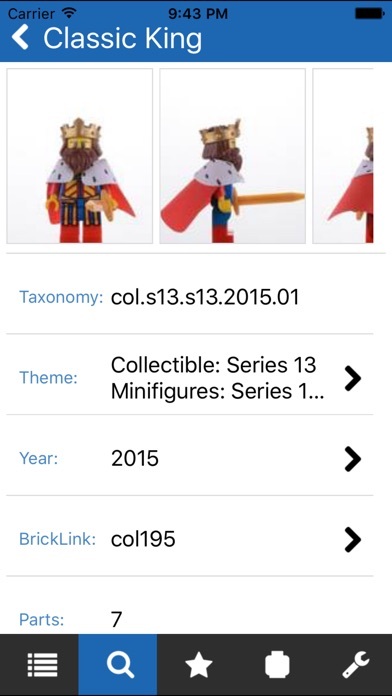 The app contains information about all of the minifigures and sets from 1975 through 2015, including all Collectible Minifigures and non-standard scale figures such as Duplo, Fabuland and Belville. This is over 7,900 minifigures, 1,600 heads and 5,400 sets! Each year, we spend several hundred hours photographing, cataloging and updating the app with all of the newest minifigures released. Professional high-resolution photographs of every minifigure and the associated data are included. Click on the thumbnail to get a full screen picture that you can zoom into. 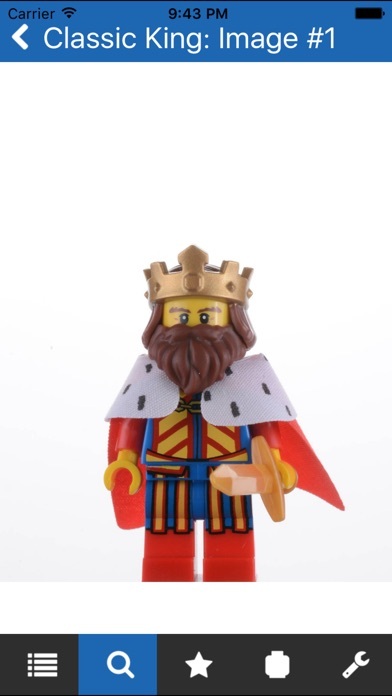 Browse the minifigures and sets by name, theme or year. 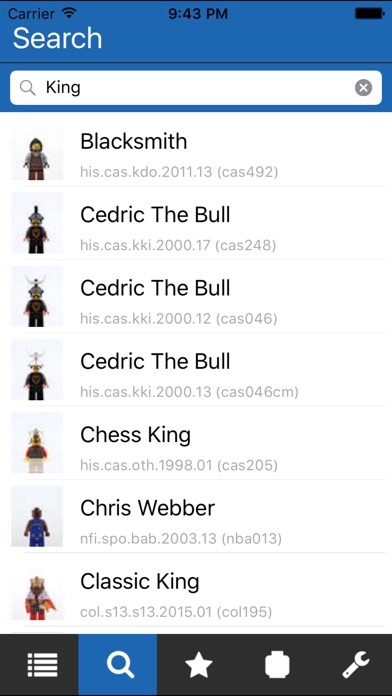 The Unofficial LEGO Minifigure Catalog App can even import/export your data to Brickset.com. Note: We are in the process of trying to acquire all 2016 and 2017 minifigures to photograph. If you or someone you know has a collection, please let us know: support@minifigure.org Features === * More than 7,900 minifigures, 5,400 sets and 1,600 heads listed * Collectible Series 1-16, Team GB, The LEGO Movie, The Simpsons 1 & 2, Disney and more * High-resolution photographs of every minifigure and head * Browse by name, theme or year * Search by name * Manage favorite minifigures * Mark the minifigures you own * Import and export with Brickset.com * Images are downloaded and cached to your device only once needed * Regular free maintenance updates System Requirements and Limitations === * The App runs on all iOS devices, including iPad, iPhone and iPod Touch. iOS version 7.1 is required. * The application uses your internet connection to download the images the first time you look at them. We recommend using a Wi-Fi connection to avoid possible charges from your network provider. Once loaded, the images are cached on your device and no further internet connection is required. * A Brickset.com account is necessary to import and export data to it. Please notice that neither Brickset.com nor our App is able to resolve version conflicts. 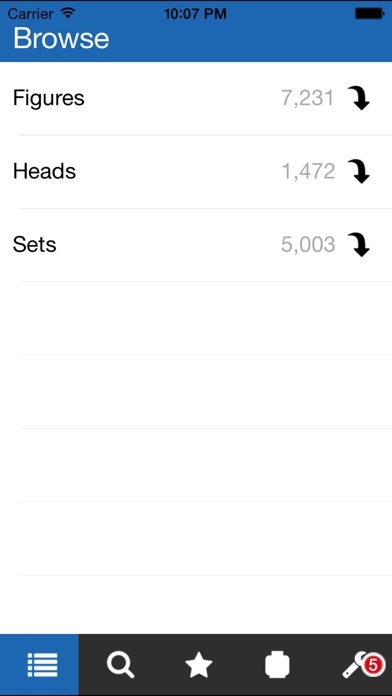 If you edit the same figure on both the App and the website, then one of them will be lost. It is also possible that Brickset.com has minifigures that are not yet in our App and vice versa. Support === Please let us know if you experience any problems with the App. You can leave a comment at http://www.minifigure.org or send us an email at support@minifigure.org. The Unofficial LEGO™ Minifigure Catalog is © 2018 Christoph Bartneck. The Unofficial LEGO™ Minifigure Catalog App is © 2018 Christoph Bartneck and Nic Jansma. LEGO and the LEGO logo are trademarks of the LEGO Group, which does not sponsor, authorize or endorse this app. Ich habe nichts dagegen, für Inhalte zu bezahlen, wenn sie gut und nützlich sind. Ich habe die App schon recht lange und bin vor allem von der Bedienung sehr enttäuscht. Umständlich und die Updates sind sehr schlecht umgesetzt. Abhocke,man muss die letzten Jahre alle noch mal einzeln bezahlen ! Vom Grundsatz eine tolle App.,aber leider crasht die App. wenn man alle Köpfe gelistet haben möchte!!! Eigentlich eine nette Idee, die alten Kindheitserinnerungen "hervorzukramen". Leider sind besonders die späten 70er und frühen 80er unvollständig und total fehlerhaft (Sets aus den 90ern tauchen in den 70er Jahren auf und viele Abb. fehlen) - was für einen historischen Katalog tödlich ist! Präsentation und Layout der App sind mies. Die Funktion "zu eigenen Sets hinzufügen" funzt meist nicht. Spart Euch das Geld für die App - das Buch ist deutlich besser!